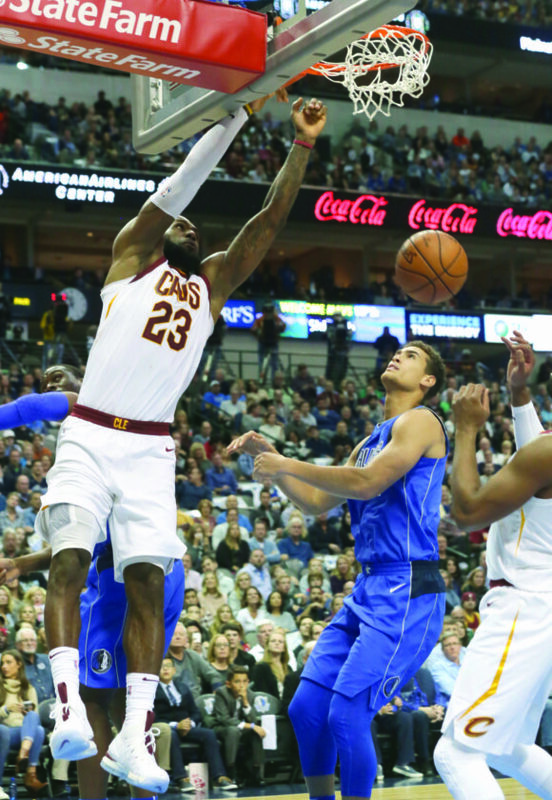 DALLAS (AP) — Kevin Love had 29 points and 15 rebounds and Kyle Korver scored all 13 of his points in the fourth quarter to help the Cleveland Cavaliers beat the Dallas Mavericks 111-104 Saturday night. The Mavericks were down by as many as 11 points in the fourth quarter and cut the lead to one on two occasions but could never take the lead. With the American Airlines Center crowd standing for most of the game’s final four minutes, Harrison Barnes missed a 3-pointer that would have put Dallas up by one. Korver was fouled on the rebound and made both free throws to put the Cavs up 106-102, and Cleveland clinched the game with free throws. Barnes finished with a team-leading 23 points and Dennis Smith, Jr. had 21 for Dallas, which is tied with Atlanta for the NBA’s worst record at 2-11. LeBron James, averaging 36 points in November, had just 19, but two came on an emphatic dunk with 1:08 to play that put Cleveland up 104-100. The Cavaliers outscored the Mavericks 34-22 in the third quarter to erase a three-point halftime deficit. Love scored 13 points in the first 5:38 of the quarter, and Smith’s long 3-pointer keyed a 15-2 run and forced a Dallas timeout. Cleveland used an 18-2 run in the first quarter to wipe out an early 10-point deficit and neither team lead by more than six points for the rest of the half. Dallas took a 52-49 lead into the break with Barnes scoring seven of his team’s final 11 points. Cavaliers: Starting point guard Derrick Rose missed his second consecutive game with a left ankle sprain. Iman Shumpert started in Rose’s place. The team set no timetable for Rose’s return. … Tristan Thompson missed his fifth straight game with a left calf strain. The Cavs have averaged seven fewer rebounds per game with Thompson out of the lineup. Cavaliers: Continue their four-game road trip at the Knicks on Monday. Mavericks: Play the second half of a back-to-back at Oklahoma City on Sunday. Dallas then plays four in a row at home.